Have you tried explaining what Toro Y Moi sounds like to someone who hasn't yet heard the work of Chaz Bundick? It's a formidable task. Do you start by describing the organic-sounding drum loops? Or would it be easier to begin by mentioning the eclectic studio production, which resembles a peaceful meeting of J Dilla and Air? Don't forget to mention the straightforward indie-rock approach to songwriting, and extensive use of guitars to be found throughout! Before you know it, you're making comparisons to Bundick's first band of note, Heist and the Accomplice; a solidly guitar-oriented alt outfit. At this point, the befuddled person you're describing this too still has no idea what Toro Y Moi sounds like... but they're definitely interested to hear it. This dilemma would face any of us who became quick fans of Chaz's work in 2009/10, when he charmed the internet indie-sphere with the likes of "Blessa" and his cover of Michael Jackson's "Human Nature". 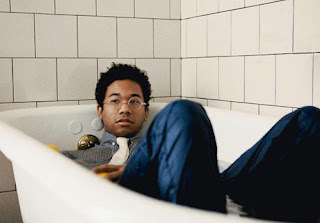 Of all the artists to be summarily condensed by bloggers and critics under the already-dated moniker of Chillwave, Toro Y Moi easily stood out as a more unique blend of not-quite-blue-eyed soul and synthpop songcrafting. But at the time, it was hard to articulate just what, exactly, made his work more engaging than other appealingly like-minded acts such as Washed Out, Neon Indian, and Memory Tapes. Bundick's first work is largely regarded as having been a solo affair, and sounds like it. There's a distinct Bedroom feel to the way the verses and choruses are stitched together by ambient volume swells and synth sweeps. And the songs are unhurried; there is no human drummer to keep up with, and more electronic flourishes to play off of instead of live instruments. Still, it's a remarkably consistent and colorful collection tracks that draw you in and just plain work. I have no reservations about calling Causers of This one of the best albums released in 2010. The fact that Causers of This arrived with such a clear and tasteful musical identity made it all but impossible to avoid scrutinizing its follow-up for similarities, as well as to look for indications of where Toro Y Moi's evolution was heading. After all, an artist's second album tends to say quite a bit about what can be expected from them in the long run, and the sophomore release can be a particularly vexing moment in the artist-fan relationship. Many artists simply repeat the successful formula with workmanlike precision, and make some modest upgrades to their sound (such as TV on the Radio). Their new material seems familiar yet forward-moving. Other artists repeat the formula, but can't quite conjure the energy that came with their initial work (the Strokes). Their newer work seems efficient, yet unexciting. But a select few artists are able to advance their ideas to the point of achieving trailblazer status, all while still delivering the goods that their fans have come to expect. In this writer's opinion, this is the realm of recent bands like Animal Collective, the White Stripes (circa 2002-04), and the Flaming Lips (1999-2001). Underneath the Pine makes a serious bid for this territory by taking the warm electronics of 'Causers' and puts them behind the very distinct sounds of a live, living breathing band. Not many artists these days start off in the world of beats n' loops only to make the jump into pavement-style indie guitar rock. Admittedly, these are some serious accolades to be throwing out, even for a self-described fan such as myself. Nonetheless, I can't deny that listening to these two albums puts me and my ears in the same place as the aforementioned contemporaries do – these are artists that help me set my personal yardstick for what is Good in music. It's a bit strange to have so quickly developed a similar affinity for Toro y Moi, an artist who has barely begun their musical career. Increasingly over the past few years, the buzz cycle in Indie music has made it very difficult for listeners to genuinely buy into and enjoy an artist without throwing out qualifiers, disclaimers, and moderating one's enthusiasm so as to avoid the stigma of seeming to "serious" in one's enjoyment of music (unless you own all your music on vinyl, which I do not). It's as if there is now a built-in level of shame that comes with being a music fan, which causes us to keep our distance and hedge our bets on emergent musical acts. Is it really OK to enjoy and regard an artist in 2011 with the same level of artistic admiration that we did back in 2000? Is it safe to go out on such a limb anymore? Sure it is. If we can no longer identify contemporary standard-bearers, then there are no reasons left to discuss artists outside of their own self-contained musical shells. I'm happy to report that we still live in a world where an artist can come along and create something cutting-edge, and the dual pairing of Underneath the Pine and Causers of this stands as exhibit A. While Toro Y Moi is by no means the only artist around today who is worthy of being considered as such, this music makes for a good example of how an artist can still find an artistic perch placing them above the blogospheric riff-raff without resorting to anything more than a wildly inventive collection of songs. Taken as a pair, Toro's two full length albums map out a collection of sounds that seem fresh, even as they draw from the various Indie trends which we have been steeped in for the past decade. The combination of synth lines, gentle vocals, ambient noise effects, and undistorted guitars doesn't sound particularly unique on its own. The uniqueness of Toro Y Moi is not found in outlandish instrumentation or stage persona gimmickry. It is in the ephemerally subjective realm of "feel" where Bundick is able to create something new from these old ingredients. And the beating heart of that feel/style/sound can be found in the groove and R&B pulse that underlies the majority of both these albums. 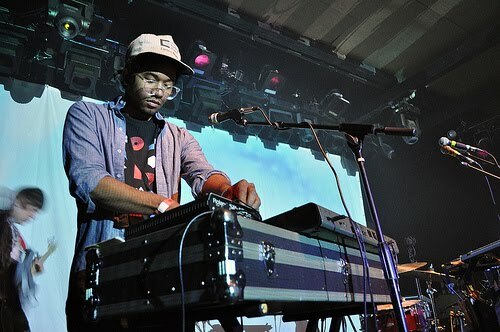 The sounds of early-80's soul/funk permeate Toro y Moi, especially on the second album. The synth riffs in Under the Pine sound like they've been lifted straight out of the late-era Motown library. Many of the lush chord progressions, which are both lifting and meandering, are reminiscent of Marvin Gaye's "What's Going On". And just listen to that bass on "New Beat"...that's prime Bootsy Collins territory. Bundick's decision to cover an MJ song seems fateful in retrospect, as it makes clear that this mashup of indie and pop/soul is at the heart of what Toro Y Moi is. These funk-lite grooves are more prominent on Underneath the Pine, as they sound more explicit and intentional when played through the live-band arrangements that were absent from Causers of This. In this regard, it's notable how listening to Underneath helps to retroactively clarify some of the decisions that were made on the more mercurial Causers. Underneath the Pine serves to clarify that, yes, Toro Y Moi is serious about having some dance-ability in these songs, and yes, there will by groovy synths and there will be bouncing bass lines, and no, this is not meant to be ironic at all. Toro Y Moi, more than any other artist today, is able to give his songs a healthy dose of these elements without falling prey to the trappings of self-conscious distancing or genre aping. It’s good tonic for shrugging off that built-in Indie-shame that infected so much music appreciation in the 2000's. A particularly good example of the retrospective clarity that Underneath affords Causers can be found in the song "Minors." The track opens with a big, exuberant blast of synthpop chorus that sounds like a sugary Valentine's Day card caught on tape. The song itself is solid, featuring a ponderous verse that steers clear of any silliness. And when those big synths hit again, it's a risk that ends up working. But are we, as listeners, really supposed to get on board with this? Is Bundick actually embracing this pop element as firmly as the song seems to imply? Are we sure that this big-hearted moment isn't some hipster conceit? After experiencing the earnest commitment given to pop and soul genre sound on Underneath the Pine, it becomes clear that, yes, this was Bundick's idea all along. No, its not some experimental flirt with soul, to be kept at arms length and merely regarded as a kitschy or "interesting" half joke. Toro y Moi really means it. With that reassurance, we can re-approach Causers of This and recognize it for the genuinely inspired fusion of genres that it is. While many would claim that Underneath the Pine currently stands as Bundick's most definitive work, this author maintains that Causers offers a more adventurous collection of sounds and songs which take greater risks and provide a more lush exploration of the genre. A laptop-oriented affair, Causers' inventive use of synthesizers and volume swells paints the songs with more color and dreaminess - qualities that are essential to counterbalance the pop and R&B elements which are also present. Bundick's remarkable use of side-chained compression/volume swells and fast stereo panning creates a psychedelic effect on Causers so striking so as to almost be considered a signature element to his sound. Sadly, this production technique is missed on the second album, along with the likes of fever-dream tracks like "Lissoms." Still, the increased use of guitars and live drums is a welcome addition, and it's arguable that Underneath the Pine boasts a better collection of choruses to get embedded in your brain. However, Underneath the Pine's primary strength is its authoritative melding of Indie-Rock sensibilities with nostalgic R&B sounds. It leaves one wondering if any other artist today is making this cross-genre approach work as naturally and effectively as Chaz Bundick. Truth be told, mixing R&B or Hip Hop/Rap with Indie has tended to yield big, flashy romps that often times veer into cheesy/ironic territory (Major Lazer, Gnarls Barkley, Janelle Monae, Justice). Furthermore, the Indie Rock side of these efforts is always secondary to the need to get that bass thumping. In contrast, Toro y Moi is able to make a genuinely equitable combo by ensuring that the electronic/DJ elements present have both Indie appeal (the psychadelic ambience) as well as some get-down-tonight movement (the looped beats and sharp synths). And by funneling it through a sonic perspective that really can only be described with the now-controversial word "Chill", Toro y Moi makes it look easy. The relationship between "Rock" and "Hip Hop" (to use the most general of terms) has always been tenuous, full of false starts and failed projects. The fan base overlaps and parts ways at odd junctures, and it’s hard to get a good crossover project to work. But these albums should matter to us because they are quite obviously not "crossover" affairs. They represent a fully formed genre of its own, and Toro y Moi is inventing much more than it is borrowing. Bundick is firmly in control here. The songs exude a sense of familiarity with themselves, as if they emerged from a rich and long history of electro-ambient-indie-groove-guitar-etc artists. But of course, there is no such history yet. Bundick is making it up as he goes, and might just be writing its first pages.